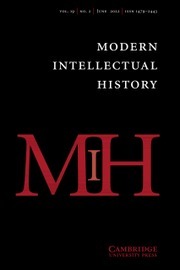 Modern Intellectual History publishes scholarship in intellectual and cultural history from 1650 onwards. MIH concerns itself primarily with apprehending the contextual origins and receptions of texts in order to recover their historical meanings. But we understand ‘texts’ in the broadest sense, so as to encompass multiple forms of intellectual and cultural expression. These include, but are not limited to, political thought, philosophy, religion, literature, both the social sciences and the natural sciences, music, architecture, and the visual arts.